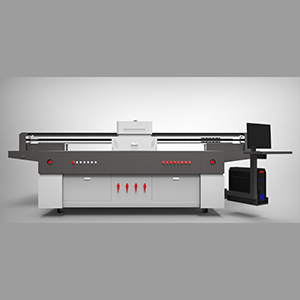 Angel T-UV2513 RICOH flatbed printer has with all-steel integrated structure, steel frame support dense and stable. X, Y-axis movement system use imported servo motor, to ensure the precision of mechanical transmission, durable and long life time. Suction platform can be free to adjust the sub-area, air volume, adsorption of different materials, the platform surface hardness, corrosion resistance, suction uniform and stable. To avoid the print head and the media friction, to extend the print head life. Our machines can meet customer all requirements about ultra-high precision and high-speed. Ricoh GEN5 head: gray-scale piezoelectric nozzle, a print head with 1280 nozzles, the accuracy really reached 2400DPI. Ink droplets minimum 7PL, maximum 35PL, best for UV ink, water, solvents, weak solvents and other ink. Super corrosion resistance, 24 hours without interruption of work, the average life of 3-5 years.